I wrote this letter today on my phone as I waited in two hospital waiting rooms. It is a follow up to an article I wrote for the local paper a few months back. It is quite local, but I think what it does is highlight the narrow thinking of the present system of Council budgets and how they can subvert other, perhaps long term strategic plans they might have. I had a very positive reaction to this article from fellow cyclists and from drivers some of whom told me that after reading the article they had modified their attitude and behaviour towards cyclists. 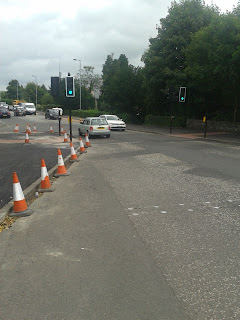 This behaviour change, alas, did not reach as far as East Dunbartonshire Council (Glasgow have at least made some repairs to the Maryhill road that have made that part of my commute a little safer- though it still has a long way to go). 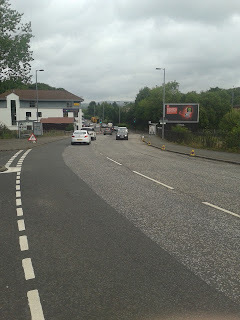 East Dunbartonshire Council has made, at what is one of the most dangerous parts of the Milngavie Road, into what quite honestly is a death trap. It seems the panic to spend the road "improvement" budget before the end o the financial year has led someone to make the decision to narrow the road at Hillside Drive/Hillfoot Station trafficlights. When work started I was optimistic the council were going to upgrade a stretch of their "psychopath." Alas, this work seems to have been done in order to ensure no-one blocks the driveways of the houses opposite the Filling Station and in doing so, the traffic lights, with their push button technology that stops the traffic, have been moved out from the previous edge of the footpath so users can see more clearly, the traffic they have stopped. Other than that they have created an extremely dangerous bottleneck at the base of what is increasingly a dangerous road bridge. The Hillfoot Railway bridge is incredibly dangerous for cyclists on a number of counts. 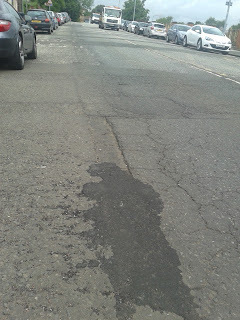 Not only is it extremely busy at most times- and especially so at commuting times, its road surface is covered in ruts and potholes. This with the added assault course of parked vehicles whose doors can open out onto the road at the distracted whim of parked motorists, means that cyclists can be near to the centre of the road when on it. Cycling using a road touring bike with characteristic thin tyres and trying to avoid the pits and ruts makes this inevitable. Cycling over the bridge towards Milngavie at rush hour with impatient motorists behind is scary. And having to negotiate the idiotic new bottleneck as these impatient motorists overtake- or at least attempt to overtake- is perhaps suicidal. 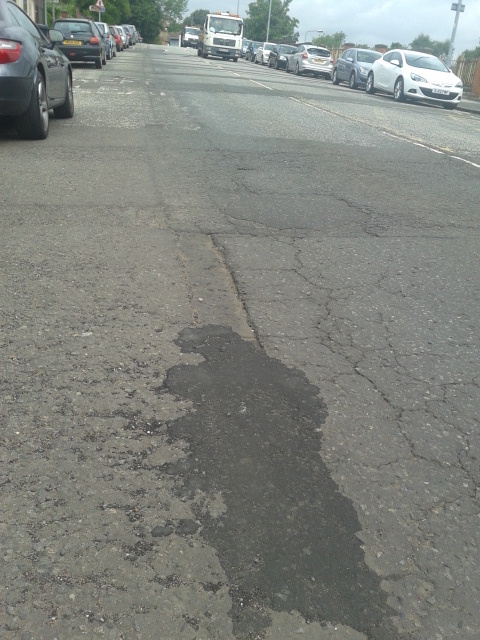 Where is the green thinking in our roads department? It almost seems the attractively mono-blocked parking spaces and convenient pedestrian viewing platforms have been rustled up to ensure budgets are spent. I would like to suggest two things. First of all, during the next budget under spend panic, the lights are relocated back to where they were. Moving them further into the road does nothing to help pedestrians, motorists and have created a possible death trap for cyclists. Secondly I would like to suggest this "campaigning paper" has a cyclist’s column- one in which cyclists in the area could have say- and could send in positive and negative experiences/photos of cycling in the area? Perhaps a persistent naming and shaming of just where our council is trying to kill cyclists will influence the chamber to think green and safe at least in this important area. And perhaps an enlightened attitude to the increasing cyclist population through improved roads and safety may add to the attraction of the greener of the commuting options and of the area as a base for tourists. It's a ridiculous and surprising modification. It increases the bottleneck at this already, very busy area. Before roadworks were done cars turning left before the filling station had more space and cyclists had broader room to manoeuvre. I've sat in traffic for a timely period and watched as cyclists literally take their lives in their hands winding through stationary traffic at peak times. Now with the extension of the pavement at the pedestrian crossing, vehicles merging from Roman Drive and impatient drivers wanting to move off, they often forget to check for the cyclists coming into the middle of the lane. It's truly frightening.